So, you want to take on the Barrows Brothers with more of a challenge? Look no further, Rise of The Six is your place to go. 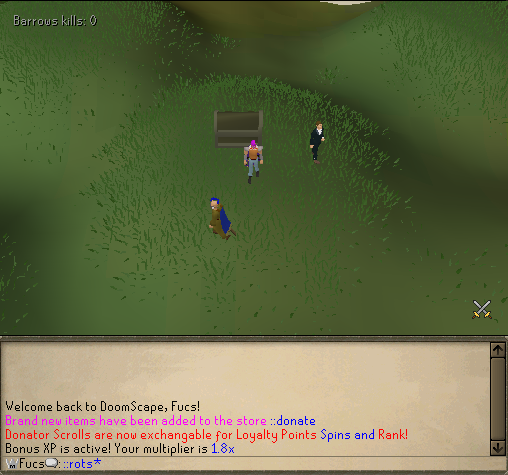 You will see this location on teleport (You will be familiar with it as Barrows). After arrival, talk to the Wise Old Man, he's the NPC wearing the blue partyhat, blue cape and brown robes, with a staff. To begin the encounter, take the potion. Your character will proceed to drink the strange liquid and then collapse on the floor. Continue with the dialogue, and choose the first option 'Take control of the dream' to begin the minigame... Or choose the second option 'Wake me up!' 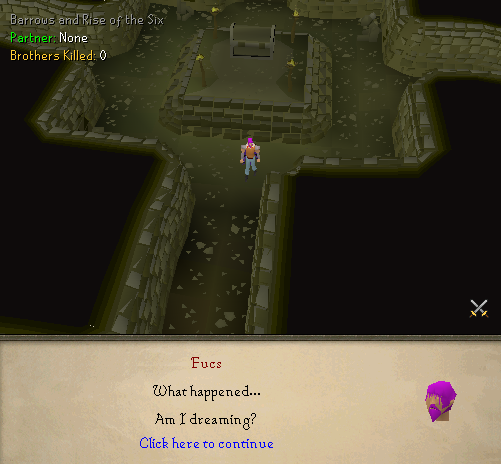 if you're scared- This option returns you to Barrows. If you miss the dialogue, somehow cancelling it. Simply click the chest to begin. Within seconds of choosing to take control, the ground will shake, and the barrows brothers will spawn! You will fight many brothers at once, and you or your partner cannot die in order to complete the minigame! Once you have completed 2 waves of Brothers, your reward will be added to your inventory/inventories. The best loot you can receive is Crystal of Power, currently valued at 25B+ at the time of this guide being written!